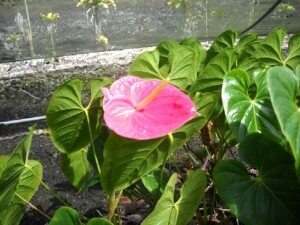 The Marian Seefurth is one of the earliest varieties of anthurium developed by the University of Hawaii. It produces a beautiful pink flower and it was released all the way back in 1963. It produces close to seven flowers a year, but it is susceptible to blight. Fortunately, it displays some resistance to anthracnose. On our farm, our Marian Seefurth’s tend to be a little more susceptible to fungal issues with their foliage than some of the other varieties that we grow. The standard solution to this problem is frequent applications of fungicide. But rather than load up on the fungicide we try to keep things under control by spacing these plants a little further apart for better air circulation, removing heavily infested plants and carefully adjusting moisture levels. How did the Marian Seefurth Anthurium get its name? It was named after Marian Seefurth, who was the wife of Nathaniel Seefurth who made a generous donation to the University of Hawaii to further anthurium research.